I got tongue-tied playing Celebrity at game-night with friends. I pronounced Zach Braff as Jaques Braff and Adolf Hitler as Adolf Hilter. 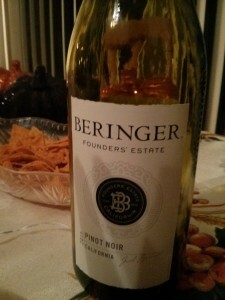 I blame my pronunciation faux-pas on this fruity, easy-drinking, somewhat-nutty Beringer Pinot Noir. A deep red (well, all the wines I had on Sunday night looked deep red in the blue solo cups), this silky wine had an earthy, plummy taste. And since the flavors didn’t stick to my tongue, it didn’t overwhelm my palate when I stuffed my mouth with Doritos during a short game-playing intermission! It’s not everyday you get to pair wine with Doritos! When to drink: This is another easy-drinking wine, that would do you good if your goal is to drink with friends and get buzzed on the cheap. ← No hangover wines: Do they really exist?